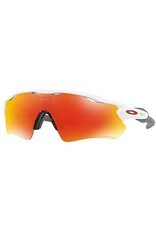 Original Oakley RADAR EV PATH OO 9208 Sunglasses. men's model , Prizm Lenses, sports shape, 2018 Oakley collection. propionate-rimmed glasses, polished white/prizm ruby colour. All Otticanet Sunglasses are guaranteed and original. For over 40 years, Oakley has been testing new technologies on its glasses, combining science and art. Oakley has obtained more than 600 patents worldwide and today it is synonymous with excellence for those who face life with no compromises. For this reason it is the favourite brand among athletes.